I have a mapcase made of clear plastic (PVC I think). It has a roll top held shut with velcro. Both sides of the velcro were attached by some sort of welding process but one of them has completely come off. I've tried reattaching it with hot glue, which seemed OK at first, but didn't survive one use. I've tried pressing the plastic to the backing of the velcro with a heated tool, but despite the hot plastic smell there was no adhesion. Not only is it my most waterproof mapcase, ideal for inkjet-printed maps in the rain, but it attaches to the handlebar bag of my bike. Replacements don't seem to be available, and it's perfect for riding to a hike, something I quite like to do. But with the velcro missing the maps simply fall out (it's at the bottom). I don't want to sew through the plastic unless I absolutely have to: it will breach the waterproof section, and I don't appear to have anything that I could use to seal the holes. 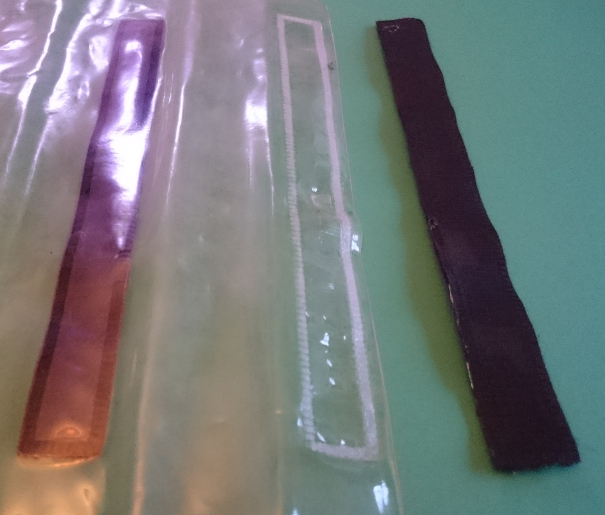 On the left, a strip of velcro that's firmly attached; In the middle, the remains of the weld; on the right, the velcro that came off. The weld (which shows up as a white rectangle) is textured in the side that touched the velcro, and smooth on the other side, suggesting that any melting was very controlled, and possibly delivered through the velcro (which has an edge of just fabric). Like you said, there are probably a hundred classes of adhesives available today, each one totally unsuitable for the things the others excel at. So we need to take a diagnostic approach here. You need flexible, which rules out many types of adhesives, including CA (Super glue), epoxies and resins, polyurethanes (Gorilla glue and I think hot glue is in this category), and many others. You also have one of your surfaces being non-porous. This rules out PVA (white glue) and Aliphatic (wood glue) and a few others which rely on "creeping" into the surfaces before curing to acheive full adhesion. So what's left? To be honest, not much, but I still haven't ruled out rubber based adhesives. This class includes rubber cement, contact cement, the Liquid Nails brand, and their relatives. Of these, I suggest some type of contact cement. Go to your favorite hardware store and read a few labels, I expect you will find one that matches your criteria. This article may help a bit as well. Note the usage directions: Apply the cement to both surfaces, allow to dry for a short time while still separated, then place the surfaces together with pressure. I am perhaps only 70/30 confident that contact cement will work for you. But I am 95/5 confident most other things will not work. Good luck, and tell us how this turns out. Not the answer you're looking for? Browse other questions tagged gear-care repairs or ask your own question. How to repair a plastic canoe? How to repair backpack inside surface?